I hope you all are enjoying some frightful happenings… as only our favorite Cozy Mystery authors can give us. I just wanted to drop a quick note to wish you all a Happy Halloween! 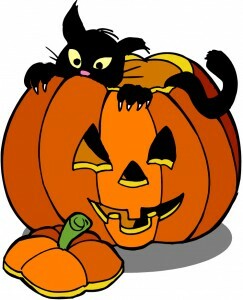 A very happy Halloween to you and your family, Danna. A VERY HAPPY HALLOWEEN TO ALL!!! It was a wonderful night here in New York’s Capital Region. We were very lucky in our city, less than an inch of snow from the freak storm. It was a beautiful day. Tons of kids out. Will settle in tonight with the new Laura Childs’ “Bedeviled Eggs”. I am half way through it and I love it. It is the first of her books I have read, but I am really enjoying it. The jacket is great, it is what attracted me to it. Sometimes that can back fire but not this time. Margaret, you’re not kidding about being lucky during this snow storm! I heard that a town in Connecticut had to cancel trick-or-treating until later this week. Thank you, Susan. Kate Borden’s Peggy Jean Turner Mystery Series is one of the very few series that I deliberately read out of order. I enjoyed the seasonal/holiday themed Cozy Mysteries so much, that I went back and read the first in this all-too-short series. I know others have commented on this seasonal Cozy Mystery series before… wishing that Kate Borden (aka Kate Grilley) would write more in the series. Had a most uneventful Halloween evening – only 3 little ones but then we live on a quiet street. Watched old movies on ‘this’ – Son of Dracula followed by Son of Frankenstein … so camp and yet classics. Oh my gosh, Petie, so did we! It was really quiet trick-or-treating. And, the next day I didn’t see one pumpkin in the middle of the street! Having Halloween on a Monday doesn’t seem quite right! Happy Halloween!!! We had about 60 trickers/treaters. Little quieter than last year, but a nice warm evening to sit out and watch the kids. Lots of skeletons this year. Maria, thanks for the Halloween greetings… 60 trick-or-treaters sounds like a lot! Margaret, if you can, I would like to recommend the Laura Childs Tea Shop Mysteries to you. They are really great books as well. Her books are what got me started reading the cozy mysteries again. Alfred, thanks for much. I was looking at some of her other series. I currently enjoy Leslie Meier, Carolyn Hart, Krista Davis, Amy Patricia Meade, Carol Higgins Clark and Jane Kelly and the “Murder She Wrote” series. Laura Childs seems to fit right in with them, except for the locales. I am really enjoying “Bedeviled Eggs”, so I will definitly check out her Tea Shop Mysteries. I like East Coast locales (places and things I am familiar with), but I love the quaint town depicted in this story. I look forward to seeing what else she has to offer. Happy Halloween! I also read Death of a Trickster. I liked it a lot. It’s a shame Kate Borden had only three in that series. Still miss my Jill Churchill and Valerie Wolzien (great Halloween) and Lee Harris holiday mysteries. I know I sound like a broken record, but the empty space is still there! Danna, here it is November already! My hubby & I just moved this week into a new apartment. Although this is a 4 plux and we are on the ground level, we only got 4 kids for Trick-or-treat! This is the lowest amount of kids that I have ever had. I love ‘ trick-or-treat.” I sure was disappointed. But I took my large supply of leftover treats to the “soup kitchen,” the people there will put the treats to good use. So this did make me feel a lot better. Christmas commercials started on TV on Tuesday. Oh well! November is the time to start reading the thicker mysteries! I just picked up John Sandford’s novel, “Buried Prey.” I will read this book this weekend.